Winner of the 2018 Standard Bank Young Artist Award for Visual Art, Igshaan Adams is best known for his idiosyncratic fashioning of rope, wire and haberdashery materials into free-form sculptures and tapestries. He arrived at his mature practice via a series of performances that included filigree sculptural forms that informed a later series of snarled sculptural installations debuted on his 2013 solo exhibition, Have you seen him? Distressed materiality and knotted, trailing forms have become key signifiers of this admired artist’s practice. This lot forms part of a family of on-going works focusing on line and texture. Introduced in his exhibition Oorskot (2016), Adams used surplus materials, bits of studio detritus and nylon rope to create enigmatic sculptures and tapestries. Underlying this formal experimentation is Adams’s commitment to exploring his Muslim identity. 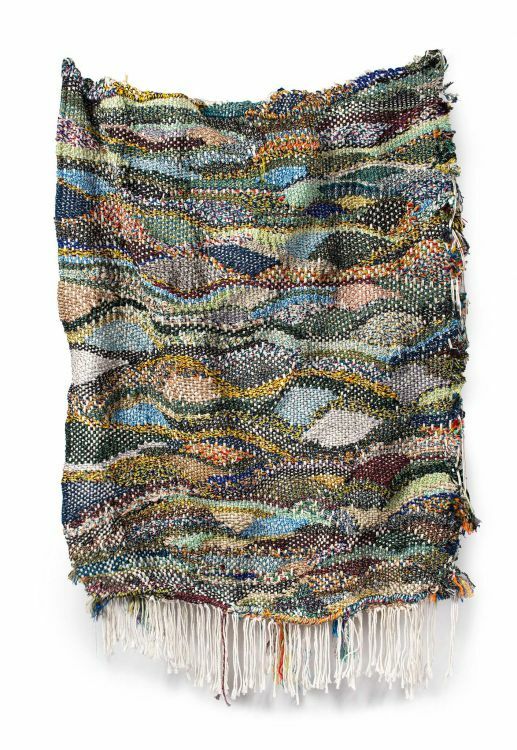 Many of his recent draperies feature abstract fields of mostly blue and green. Green was the favourite colour of the prophet Muhammad.